Meetings - Upper Delaware Council, Inc. The main stem of the Delaware is the longest free-flowing (undammed) river east of the Mississippi. 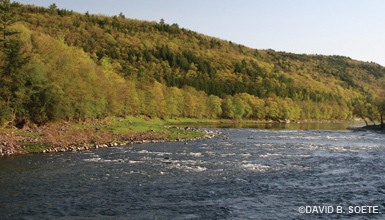 Tributary river flows are controlled by upstream reservoirs operated by the City of New York. Under a 1954 Decree signed by the United States Supreme Court, in times of normal precipitation and runoff, the average daily flow at the northernmost river gauge in Montague, New Jersey must be maintained at 1,750 cubic feet per second.